This statement couldn’t hold any more truth as it relates to Hannah Miller, 16, and Jessica Scott, 16, coaches for the Dream Catchers of Decatur. For the past two years, the Dream Catchers athletes have had the privilege of working with coaches Hannah Miller, 16, and Jessica Scott, 16. Both girls are still in high school – Jessica will be a junior at Sangamon Valley High School and Hannah will be a junior at Warrensburg-Latham High School. Each has been volunteering with Special Olympics for about 5 years and coaching the last 2 years. Hannah coaches bowling, athletics, softball and basketball, and is currently certified in both athletics and basketball. She helped coach the Dream Catchers at the recent 2015 Summer Games and said “I was truly in awe to witness these events for another year. The athletes’ kind-hearted sportsmanship never ceases to amaze me.” She has a true admiration for her athletes and everything they have achieved. 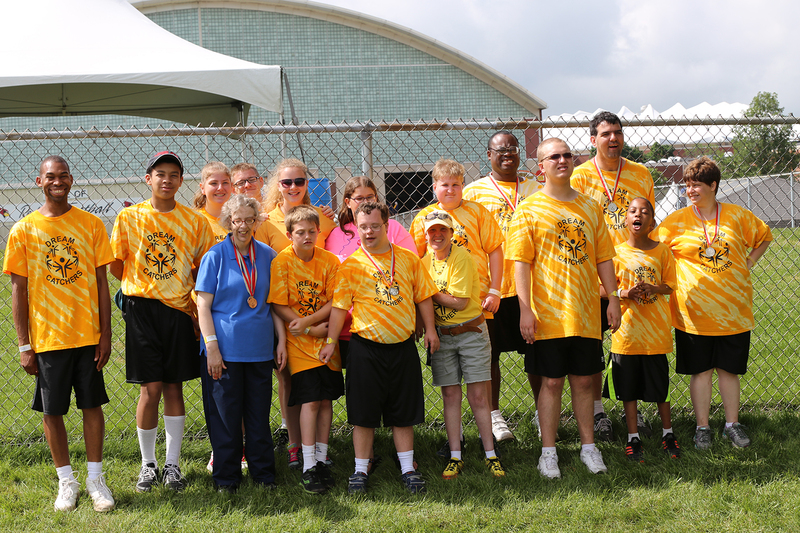 Hannah Miller is shown with some Dream Catchers athletes before the Parade of Athletes at 2015 Summer Games. The coaches and athletes who work with Hanna and Jessica really admire their commitment to the Dream Catchers and Special Olympics. “Most kids won’t ‘waste’ their time to become certified, but these two immediately said, ‘yes’ to the opportunity,” said Boys. Both girls also plan on getting their certification in softball for next year’s competition. Their ability to go above and beyond for their team is what makes them such outstanding young volunteers. 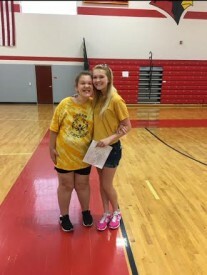 Hannah and Jessica both have younger siblings who are compete in Special Olympics, and they are the driving force behind their active involvement with the team. Hannah describes her little sister, Olivia, as “the light of my life.” Hannah gets to coach Olivia on the Dream Catchers. Jessica is in agreement that her younger brother is a big part of her life. 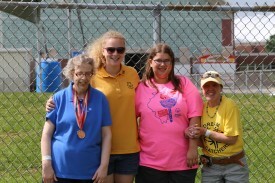 Hannah Miller is shown with her sister Olivia, a Special Olympics athlete. The Dream Catchers also have a third high school student, Kathleen (KD) Young, 16, who is involved as a coach. KD is the IHSA State Champion in both shot put and discus, and works mostly with the shot put athletes on the Dream Catchers. Regardless of her busy schedule as a student athlete, KD always makes time to be actively involved with the Dream Catchers. Unfortunately, KD couldn’t attend Summer Games this year, because she was competing herself at a track & field event in New Mexico. These three young women are the epitome of why it is so important to invest in younger generations for the future of an organization. They each plan to stay involved coaching for Special Olympics after their high school careers and beyond. 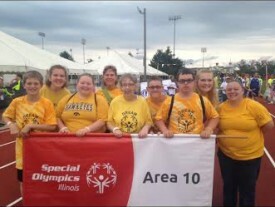 Their dedication to Special Olympics at such a young age is what will allow it to continue to thrive.